The man seen by many as the driving force behind the public transport reform has accused some former Public Transport Association (ATP) bus drivers of attempting to sabotage Arriva’s operations so they can take over the bus system again. Emanuel Delia, head of the Transport Minister’s Secretariat and Austin Gatt’s right-hand man, told The Sunday Times that “conspiracy theorists could have a field day” when analysing the behaviour in recent weeks of some of the former ATP drivers contracted to Arriva. According to Mr Delia, Arriva began to express grave concern in the last two weeks of the preparation period that former ATP drivers who had committed to work on the new service were quitting in their dozens. In the days before operations began last Sunday, Mr Delia said Arriva was fast losing its cushion of spare drivers and by last Sunday the number of drivers was at the minimum level required. “Arriva cannot be blamed for this. Most of the ex-ATP drivers have disappeared,” Mr Delia said. “Some others are still there and doing a great job. Some others are playing up, sometimes dragging their feet, sometimes vanishing when on duty, sometimes reporting faults in buses which are later found to be fine but only after more services are cancelled,” he added. Arriva has so far been unprepared for the level of enforcement and discipline it needs to run a tight ship, according to Mr Delia. “It has used its standard formulae of operations that it uses anywhere else, assuming people who work for it would want to do so,” he said, pointing out that many of its employees do and their enthusiasm in the face of last week’s adversities was admirable. “Among those adversities is bullying from ex-ATP drivers who tell them outright that they’re on a plan to scupper the Arriva project so they can take over the business again,” Mr Delia said. He added that Arriva did not seem prepared for this sort of attitude but it is now getting to grips with the situation and beefing up its supervisory and control mechanisms with experienced personnel flown over especially from the UK. “Arriva hopes, as we do, that this starts having an effect on delivery soon,” he said. On the first day of operations last Sunday, many drivers contributed to the chaotic service by refusing to work, citing the split-shifts they had been asked to work at short notice as being unacceptable and not part of the working conditions they had agreed to. Mr Delia described Arriva’s roster and changeover structure for drivers as “complex” but said such practices were standard in modern public transport operations worldwide and required flexibility and adaptability from employees. “We understand these are being simplified at higher cost to Arriva until the service is stable enough for more training to be given to drivers and greater flexibility ensured. “The shortest way to that target is filling up as quickly as possible its driver complement and weeding out trouble-makers if they are still there,” Mr Delia said. 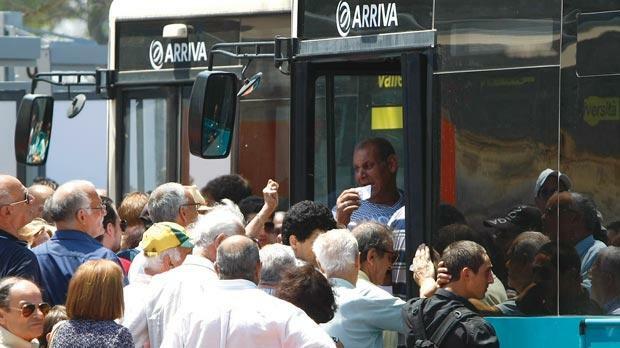 In a statement yesterday, Arriva Malta managing director Keith Bastow said the company had been hit hard by up to 180 drivers who failed to report for duty last week, more than half of whom were drivers from the former regime. More than 40 support staff, supervisors and management have been drafted from around the Arriva group to support the Malta team, along with more than 70 temporary drivers from the UK. By today, more than 50 British drivers will be on the road, with a further 20 drivers entering service early next week. Mr Bastow said these drivers have received training on the specific routes they will be working on. Fifty-four Maltese drivers are currently in training and Arriva is continuing its recruitment drive in Malta. “To address issues with services in more remote areas with lower passenger numbers, with the consent of Transport Malta, Arriva are temporarily sub-contracting some of the feeder routes. Vehicles on these routes will clearly display an Arriva logo and route number,” Mr Bastow added. disappointed at the extent of the difficulty of the transition. rightly hoped for a change. itself in Malta and in the many other cities around Europe it operates. intolerant now of what it would readily though unhappily accept before. yet to win the competition for customer support. hop on board out of choice, not merely out of necessity." their destination in reasonable time. "The public transport service contract was won by the tender from a transport company of international repute, operating bus systems in nineteen different European jurisdiction and owned by Deutschebahn – the apex of the European transport business. We could hardly have aimed for or got more as far as quality is concerned. If they cannot get it right, who can? "So, as far as delivery is concerned we have every reason to believe that this was a freak start and after these unforeseen and in some cases unforeseeable obstacles are overcome we can look forward to the service we deserve."